Spring steals you don’t want to miss. You are here: Home / Incoming Email / Spring steals you don’t want to miss. 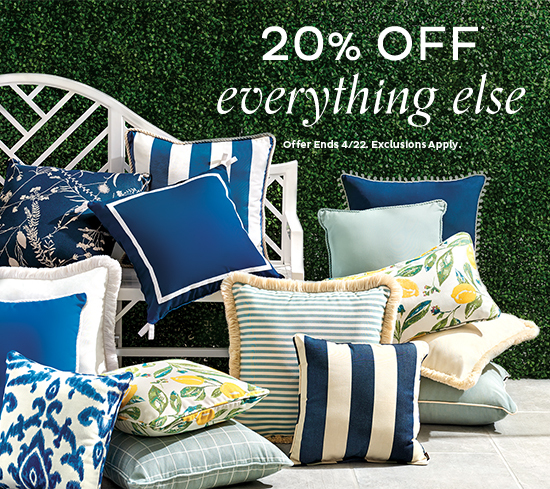 *25% Off All Furniture Indoor & Outdoor and 20% off everything Else offer valid through 11:59 PM EST, 04/22/19. Offer not valid with any other offer, unless specified. Price as marked. Cannot be applied to previous orders or gift certificates. Promotion not available in Ballard Outlet Stores. Shipping charges are based on item price before discount is applied. No cash value. Void where prohibited by law. Void if purchased, sold, or bartered for cash. Offer valid in the U.S. only.